Why Ongoing WordPress Website Maintenance is so Important. Amay Web Design has completed your website project, and your site is now live. You are all set for business, but what happens to your site from here? Most people think that designing and building the website is all that there is to it, but a website is not a set and forget type of thing. In our opinion, WordPress is one of the most dependable and supported Content Management Systems available, but just like any software, websites require maintenance to keeping them running smoothly. Some business owners are lucky enough to have some technical experience and opt to do the maintenance themselves. But what if you are not skilled or simply would rather concentrate on building your business and sales? So what is the answer? Avoid doing website maintenance? Bad Idea ! Here is why.. Think of your website as a new car. At first it is all new and shiny, and runs very well, but over time, if you don’t get it serviced, replace the oil, tune the engine, it starts to play up, until it eventually stops running altogether. Your website is the same, as updates to software, plugins and themes are released, if you ignore them, it is only a matter of time before your site runs into trouble or stops working. Can your business afford that? Your website should always be live, ready for customers, sales and presenting your business at its finest. If you don’t have website maintenance carried out regularly, you may as well throw your money out the window. When visitors go to a website and find it doesn’t work as expected, they often leave, taking thier business elsewhere. We often see new clients come to us with broken sites, and in most cases, it is because their site has never been updated or maintained. 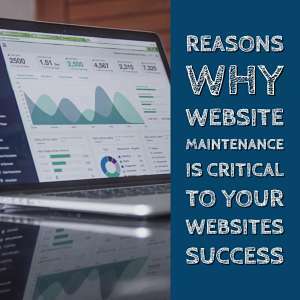 Many website owners don’t realise they need to check thier website to see how it’s functioning, or that potential customers could be lost because of missed website issues or downtime. Now that you see the importance of Maintenance, let’s explain the Benefits. Your sites load time, downtime and uptime, all depend on the WordPress software, themes and plugins functioning as they should. WordPress CMS core should be updated to the most recent version, at all times, as updates often fix vulnerabilities or incompatabilities. Your websites growth, content, analytics monitoring and design changes, all depend on you having someone making sure all updates to the website are done in a smooth and error-free fashion. There will be times when doing updates that plugins or themes that previously worked fine together, suddenly are not compatible and will cause your site to break. This is where a professional developers skills are invaluable. My vast experience and expertise updatng websites, allows me to take the precautions to ensure all goes smoothly. If something should go wrong, I have the skills to quickly resolve any issues to minimise any loss of website function.At Amay Web Design, I take great care to first backup the website, and check the website after the updates for any issues. Our professional software keeps a record of plugins we update, so if there is ever an issue we can see what plugin caused the issue and revert the plugin back to the last working copy. Page bloat, crashes, post revisions, and posts that contain broken links and other irrelevant information hurt your SEO over time. Outdated software and site issues can affect website load times, which can greatly affect your position in search results. Your search rankings fall if pages or posts continue to cause problems with user interaction and page views on your site. Neglected WordPress websites are left wide open for potential safety threats. From hacking attempts to transaction vulnerabilities, security threats lurk around every outdated plugin and broken link on your site. Keeping your site regularly updated, may deter potential security threats and keep your content, important information, customer details safe. Can’t I do the Maintenance myself and save some money? The straight up answer is yes, you could… but maintaining your site yourself could cost you much more than our monthly fee. For example, if you were to update from your WordPress dashboard, you wouldn’t have a record of what was done, or what went wrong. If an update to a plugin created an issue a couple weeks later, it would be difficult to know what changed and more importantly, what you should do to revert it back without restoring a very old backup, meaning you could lose content changes, sales orders, contact entries, and more). The reality is, it Costs More to Fix a Website Than to Maintain it. Inexperience and neglect can damage the look and functionality of your website. When that happens, you have a choice to make. 1. You try and fix it yourself, and risk doing further damage. Or 2. You can pay for someone experienced to fix it. Depending on the issue, this could be a very costly task. Just like your car, it costs more to fix it than it does to maintain it properly. Regular oil changes help keep your car running smoothly, regular site maintenance helps keeps your website running optimally. Wouldn’t it be best for you to deal with what you know best and let us deal with what we know best? Would you try to fight a court case without a solicitor? Then why try to maintain your own website if you’re not a web professional? By securing my services, as an experienced web professional, to update and maintain your site properly you are actually saving potential lost customers, sales and site visitors. Think of website maintenance as cleaning your office or store, like you would do with a bricks and mortar business. If you’re interested in securing a website maintenance contract for your site, contact us to learn how we can keep your website monitored, up to date and in proper working order. We offer various website maintenance packages, and are happy to take care of your site, whether we built it or not.